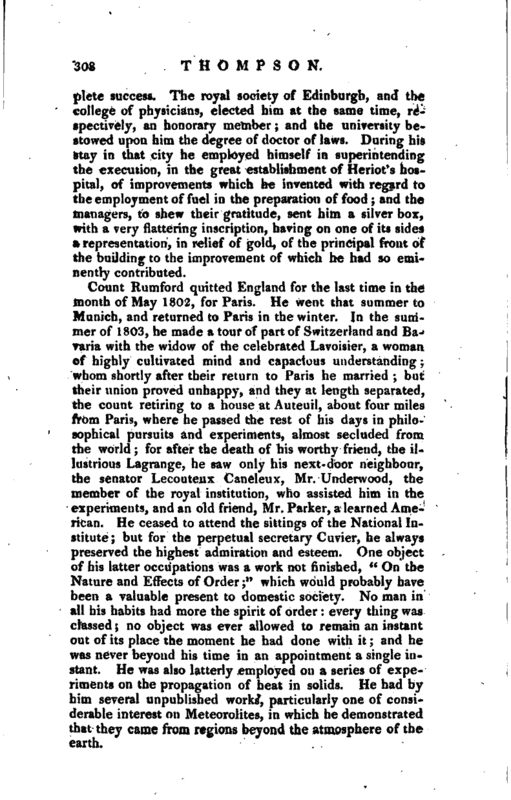 , Count Rumford, an ingenious philosopher, was born in 1753, in North America. His family, of English origin, had long been settled in New Hampshire, at the place formerly called Rumford, and now Concord; and possessed there some land previous to the war of the revolution. From his infancy his attention appears to have been directed towards objects of science. The father of one of his early companions, a | clergyman, of the name of Bernard, took a liking to him, and taught him algebra, geometry, astronomy, and even the transcendental part of mathematics. Before the age of fourteen, he had made sufficient progress in this branch of study to be able, without assistance, to calculate and to trace graphically the phases of an eclipse of the sun. He had been destined to business; but from the period of this little event his passion for learning became irresistible, and he could apply himself to nothing but to his favourite objects of study. He attended the lessons of Dr. Williams; afterwards those of Dr. Winthorp, at the college of Havard; and under that able master he made considerable progress. Unforeseen circumstances withdrew him from his peaceful retreat, and from the favourite studies which probably would have formed the chief occupation of his life, to make him act on the theatre of the great world, a part for which | apparently he was not prepared. At the commencement of the troubles of America, which preceded and brought an the war of the independence, Thompson, then twenty years of age, was united by friendship with the governor of the province, and attached to the government. 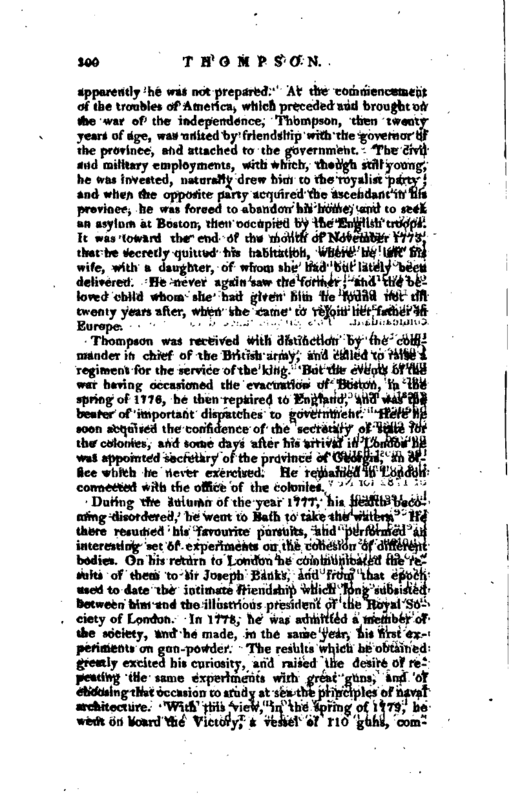 The civil and military employments, with which, though still young, he was invested, naturally drew him to the royalist party; and when the opposite party acquired the ascendant in his province, he was forced to abandon his home, and to seek an asylum at Boston, then occupied by the English troops. 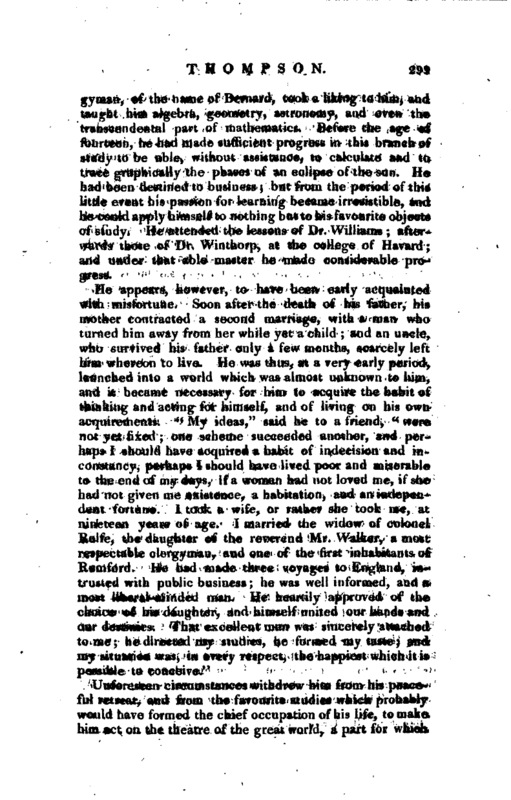 It was toward the end of the month of November 1773, that he secretly quitted his habitation, where he left his wife, with a daughter, of whom she had but lately been delivered. He never again saw the former; and the beloved child whom she had given him he found not till twenty years after, when she came to rejoin her father in Europe. 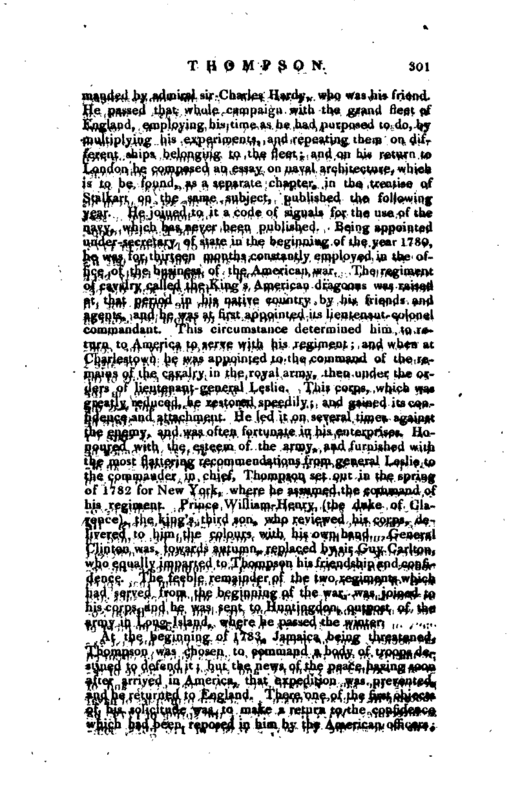 Thompson was received with distinction by the commander in chief of the British army, and called to raise a regiment for the service of the king. But the events of the war having occasioned the evacuation of Boston, in the spring of 1776, he then repaired to England, and was the bearer of important dispatches to government. Here he soon acquired the confidence of the secretary of state for the colonies, and some days after his arrival in London he was appointed secretary of the province of Georgia, an office which he never exercised. He remained in London connected with the office of the colonies. During the autumn of the year 1777, his health becoming disordered, he went to Bath to take the waters. He there resumed his favourite pursuits, and performed an interesting set of experiments on the cohesion of different bodies. On his return to London he communicated the results of them to sir Joseph Banks, and from that epoch used to date the intimate friendship which long subsisted between him and the illustrious president of the Royal Society of London. 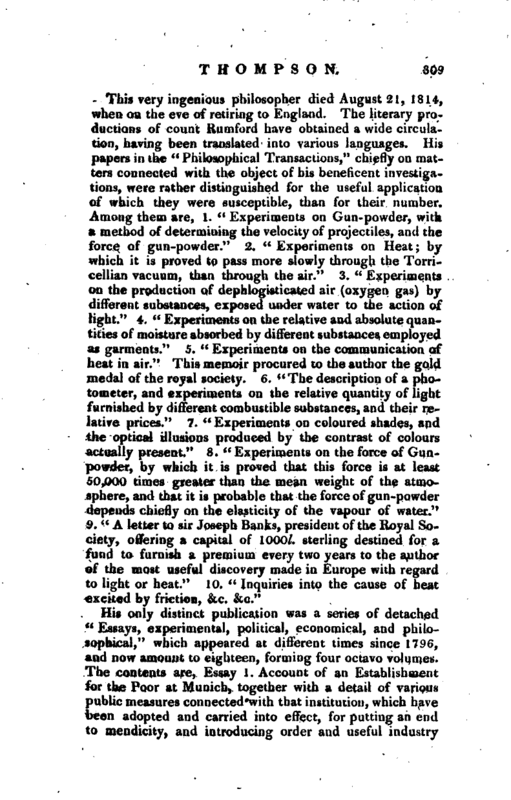 In 1778, he was admitted a member of the society, and he made, in the same year, his first experiments on gun-powder. The results which he obtained greatly excited his curiosity, and raised the desire of repeating the same experiments with great guns, and. of choosing that occasion to study at sea the principles of naval architecture. With this view, in the spring of 1779, he went on board the Victory, a vessel of 110 guns, | commanded by admiral sir Charles Hardy, who was his friend. 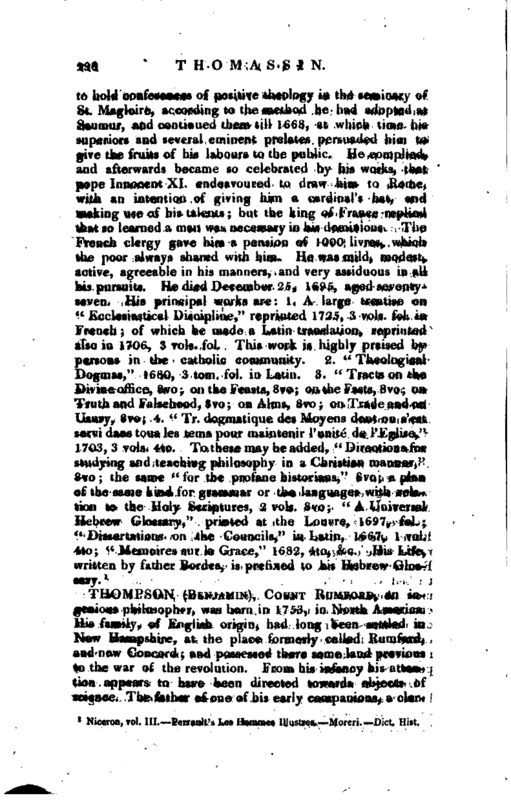 He passed that whole campaign with the grand fleet of England, employing his time as he had purposed to do, by multiplying his experiments, and repeating them on different ships belonging to the fleet; and on his return to London he composed an essay on naval architecture, which is to be found, as a separate chapter, in the treatise of Staikart on the same subject, published the following year. He joined to it a code of signals for the use of the navy, which has never been published. Being appointed under-secretary of state in the beginning of the year 1780, he was for thirteen months constantly employed in the office of the business of the American war. The regiment of cavalry called the King’s American dragoons was raised at that period in his native country by his friends and agents, and he was at first appointed its lieutenant-colonel commandant. This circumstance determined him to return to America to serve with his regiment; and when at Charlestown he was appointed to the command of the remains of the cavalry in the royal army, then under the orders of lieutenant-general Leslie. This corps, which was greatly reduced, he restored speedily; and gained its confidence and attachment. He led it on several times against the enemy, and was often fortunate in his enterprises. Honoured with the esteem of the army, and furnished with the most flattering recommendations from general Leslie to the commander in chief, Thompson set out in the spring of 1782 for New York, where he assumed the command of his regiment. Prince William-Henry- (the duke of Clarence), the king’s third son, who reviewed his corps, delivered to him the colours with his own hand. General Clinton was, towards autumn, replaced by sir Guy Carlton, who equally imparted to Thompson his friendship and confidence. The feeble remainder of the two regiments which had served from the beginning of the war, was joined to his corps, and he was sent to Huntingdon, outpost of the army in Long-Island, where he passed the winter. At the beginning of 1783, Jamaica being threatened, Thompson was chosen to command a body of troops destined to defend it; but the news of the peace having soon after arrived in America, that expedition was prevented, and he returned to England. There one of the first objects of his solicitude was to make a return to the confidence fvhich had been reposed in him by the American officers; | and he was fortunate enough to obtain for these victims of their attachment to the metropolitan country, the compensations which their sacrifices had Reserved. By a solemn act of the legislature an honourable provision was secured to some hundreds of brave officers, notwithstanding a pretty strong opposition, which rendered the issue of the negotiation very doubtful; and general Carltun having mentioned Thompson in his dispatches as an officer of extraordinary merit, the king, upon this recommendation, made him colonel, though it was but two years since he had been made lieutenant-colonel. On quitting England in the month of September 1783, he landed at Boulogne, along wiih the celebrated Gibbon, who describes him by three epithets which shew how quickly he had been able to appreciate him. He calls him “the soldier, philosopher, statesman, Thompson.” He afterwards arrived at Strasburg, where the prince Maximilian de Deux- Fonts, now elector of Bavaria, then mareschal du camp in the service of France, was in garrison. That prince, commanding the parade, discovered among the spectators an officer in a foreign uniform, mounted on a fine English horse, and accosted him; Thompson informed him that he had just been employed in the American war; the prince, pointing out to him several officers who surrounded him, ' These gentlemen,“said he,” served in the same war, but against you. They belonged to the royal | regiment Deux-ponts, sent to America under the command of the count de Rochambeau." The conversation became close and animated. 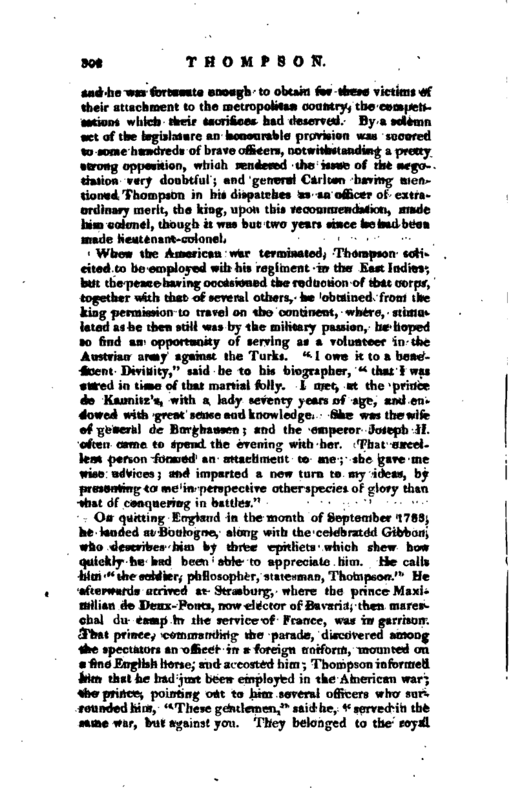 Colonel Thompson, invited, in consequence, to dine with the prince, found there a number of French officers against whom he had fought in America. The conversation turned on the events of that war. The colonel sent for his portfolio, which contained exact plans of all the principal actions, of the strong places, of the sieges, and an excellent collection of maps; every one recognized the places where events interesting to himself had happened. The conversation lasted a great while, and they parted, promising to see one another again. The prince was an enthusiast in his profession, and passionately fond of instruction. He invited the colonel next day. They resumed the conversation of the evening with the same ardour; and when the traveller at last took his leave, the prince engaged him to pass through Munich, and gave him a letter of recommendation to his uncle the elector of Bavaria. The season was far advanced, and he was in haste to arrive in Vienna. He intended to stop at Munich two or three days at most. He remained fifteen, and quitted, not without regret, that city, where the testimonies of the favour of the sovereign, and the partialities of the different classes of society, had been lavished upon him with that cordial frankness, which so eminently distinguishes the Bavarian character. 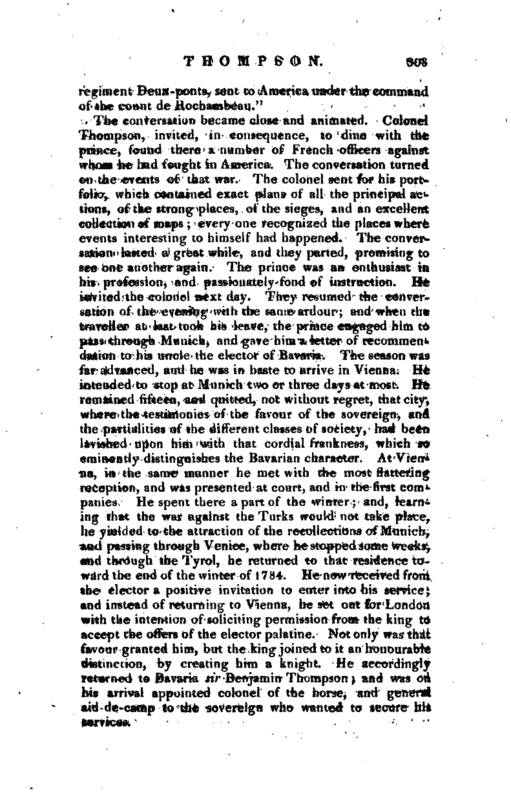 At Vienna, in the same manner he met with the most flattering reception, and was presented at court, and in the first companies, He spent there a part of the winter; and, learning that the war against the Turks would not take place, he yielded to the attraction of the recollections of Munich, and passing through Venice, where he stopped some weeks, and through the Tyrol, he returned to that residence toward the end of the winter of 1784. He now received from the elector a positive invitation to enter into his service; and instead of returning to Vienna, he set out for London with the intention of soliciting permission from the king to accept the offers of the elector palatine. Not only was -that favour granted him, but the king joined to it ah honourable distinction, by creating him a knight. He accordingly returned to Bavaria sir Benjamin Thompson; and was on his arrival appointed colonel of the horse, and general aid-de-camp to the sovereign who wanted to secure his services. | Sir Benjamin employed the four first years of his abode at Munich in acquiring the political and statistical knowledge necessary for realizing the plans which his philanthropy suggested to him for improving the condition of the lower orders, he did not neglect in the mean time his favourite studies; and it was in 1786, in a journey to Manheim, that he made his first experiments on heat. Political and literary honours poured in upon him during that interval. In 1785 he was made chamberlain of the elector, and admitted a member of the academies of science of Munich and Manheim. In 178C he received from the kin<4 of Poland the order of St. Stanislaus; in 1787 he made a journey in Prussia, during which he was elected a member of the academy of Berlin. In 1788 he was appointed Major-general of cavalry and privy counsellor of state. He was placed at the head of the war department, and particularly charged with the execution of the plans which he had proposed for improving the state of the Bavarian army. At last, the following year (1789) witnessed the accomplishment of the numerous projects meditated during those which preceded. The house of industry of Manheim was established; the islands of Mulhau near Manheim, which till that time had been nothing but a pestilential morass, useless for culture, and pernicious to the health of the inhabitants of the city, were joined together, surrounded by a mound and ditch, and transformed into a fertile garden, consecrated to the industry of the garrison. The tine establishment of the military academy of Munich was founded; a scheme of military police was formed to deliver the country from the numerous gangs of vagabonds, robbers, and beggars, who infested it; schools of industry, belonging to every regiment, were established, to employ the wives and children of the soldiers; a veterinary school was instituted, and a stud of horses provided for improving the breed of the country. 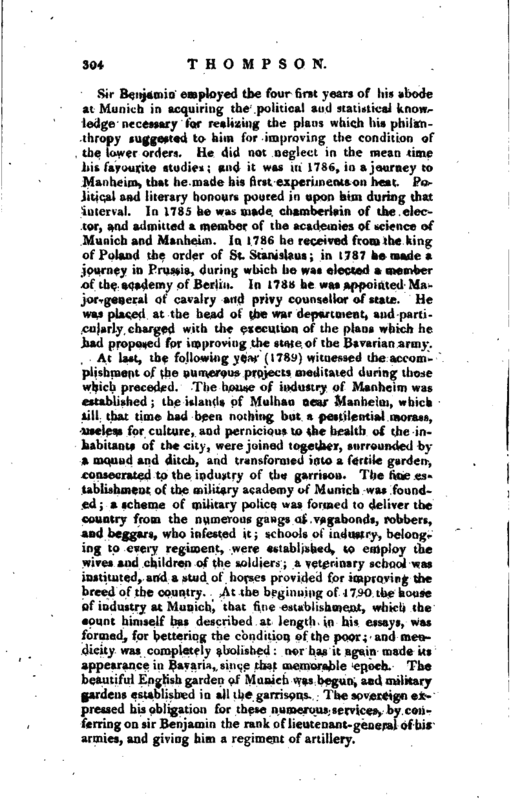 At the beginning of 1790 the house of industry at Munich, that fine establishment, which the count himself has described at length in his essays, was formed, for bettering the condition of the poor; and mendicity was completely abolished: nor has it again made its appearance in Bavaria, since that memorable epoch. The beautiful English garden of Munich was begun, and military gardens established in all the garrisons. The sovereign expressed his obligation for these numerous services, by conferring on sir Benjamin the rank of lieutenant-general of his armies, and giving him a regiment of artillery. | In 1791 he was created a count of the holy Roman empire, and honoured with the order of the white eagle. He employed that year and the following in completing his projects, and in removing the obstacles by which attempts were made to interrupt their progress. This species of labour, and the anxiety of mind inseparable from it, impaired his health to such a degree, that his physicians declared that his life was in danger, unless he retired, for some time, from business, and had recourse to a change of climate. He obtained permission from the elector to take a journey into Italy; and before leaving him, communicated, in a detailed account, the principal results of his four years administration, compared with the four years which had preceded his entrance into office. After having travelled over all Italy, and a part of Switzerland, he returned to Bavaria in the month of August 1794. He had been attacked with a dangerous illness in Naples, and his slow recovery did not permit him to resume, on his return, the transaction of the business of his department, over which he contented himself with exercising a general superintendance. He laboured in his closet; and it was at this time that he prepared the first five of the essays which he published. 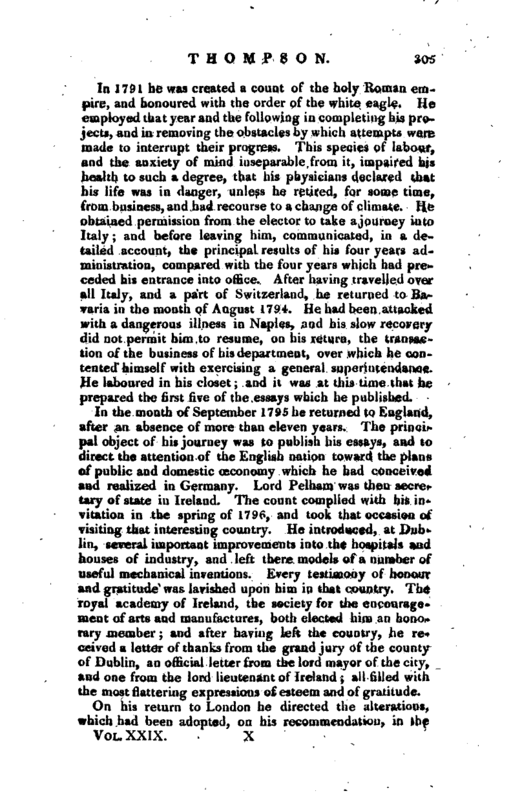 In the month of September 1795 he returned to England, after an absence of more than eleven years. The principal object of his journey was to publish his essays, and to direct the attention of the English nation toward the plans of public and domestic ceconomy which he had conceived and realized in Germany. Lord Pelham was then secretary of state in Ireland. The count complied with his invitation in the spring of 1796, and took that occasion of visiting that interesting country. He introduced, at Dublin, several important improvements into the hospitals and houses of industry, and left there models of a number of useful mechanical inventions. Every testimony of honour and gratitude was lavished upon him in that country. The royal academy of Ireland, the society for the encouragement of arts and manufactures, both elected him an hono^ rary member; and after having left the country, he received a letter of thanks from the grand jury of the county of Dublin, an official letter from the lord mayor of the city, and one from the lord lieutenant of Ireland; all filled with the most flattering expressions of esteem and of gratitude. 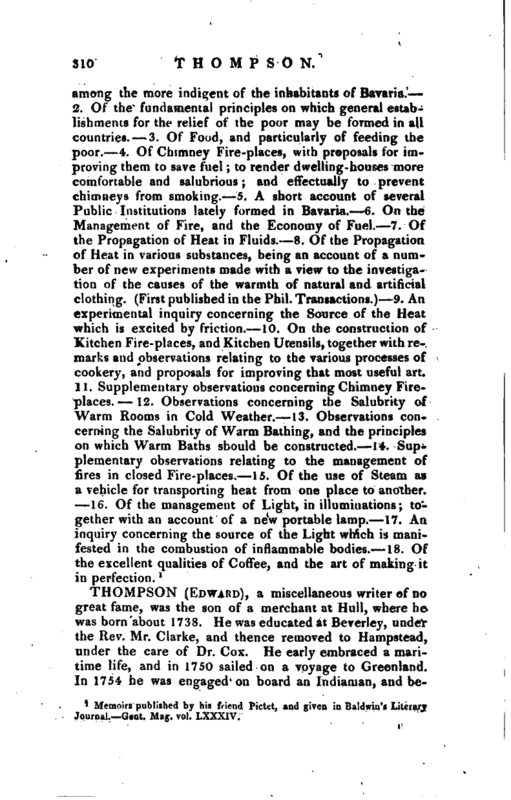 On his return to London he directed the alterations, which had been adopted, on his recommendation, in the | Foundling-hospital; and he presented to the Board of agriculture several machines, as models for imitation. The philanthropic activity which distinguished this epoch of his life manifested itself in every form It was at this time he placed in the English and American funds, two sums of 1000l. sterling each, to establish a premium to he given every two years to the author of the most useful discovery, made respectively in Europe or America, on light, or heat. The premium is a gold medal worth 1500 francs, to he adjudged in Europe by the royal society of London, and in America by the academy of sciences of America. Nothing seemed sufficient to withdraw him from these tranquil and important oc-cupations, when the events of war called upon him to display his military talents fur the service of his adopted country. General Moreau, having crossed the Rhine, and defeated several bodies of soldiers who disputed with him its passage, advanced by quick marches to Bavaria. Count Rumford, on receiving this intelligence, immediately set out to join the elector. His arrival at Munich was eight days previous to the epoch when the sovereign was called upon to quit his residence, and to take refuge in Saxony. 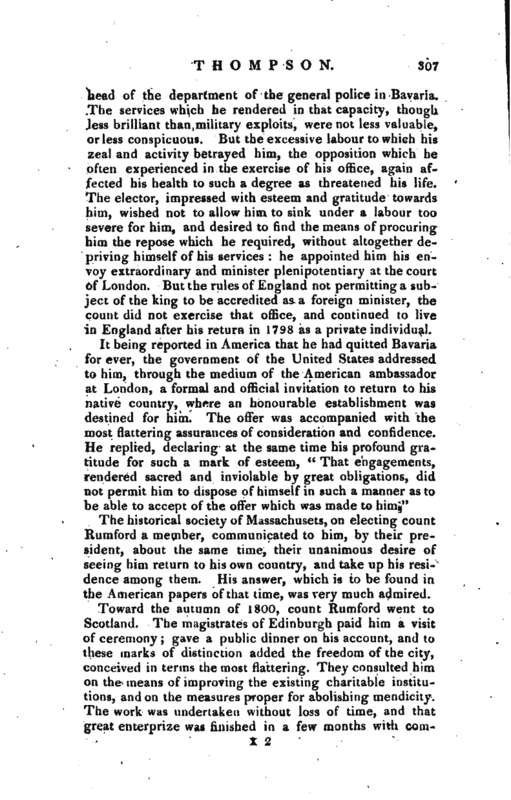 Rumford remained in Munich with instructions from the elector to wait events, and to act according to the exigency of circumstances: they were not long in requiring his interference. After the battle of Freidberg, the Austrians, repulsed by the French, fell back upon Munich: the gates of the city were shut against them. They marched round it, passed the Inn by the bridge, and posted themselves on the other side of die river on a height which commanded the bridge and the town. There they erected batteries, and firmly waited for the French. 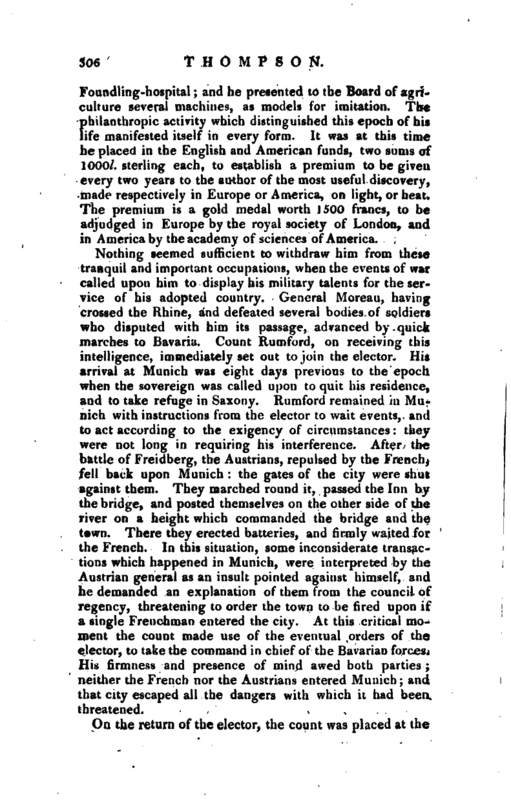 In this situation, some inconsiderate transactions which happened in Munich, were interpreted by the Austrian general as an insult pointed against himself, and he demanded an explanation of them from the council of regency, threatening to order the towq to be fired upon if a single Frenchman entered the city. At this critical moment the count made use of the eventual orders of the elector, to take the command in chief of the Bavarian forces. His firmness and presence of mind awed both parties; neither the French nor the Austrians entered Munich; and that city escaped all the dangers with which it had been threatened. On the return of the elector, the count was placed at the | head of the department of the general police in Bavaria, The services which he rendered in that capacity, though. Jess brilliant than military exploits, were not less valuable, or less conspicuous. But the excessive labour to which his zeal and activity betrayed him, the opposition which he often experienced in the exercise of his office, again affected his health to such a degree as threatened his life. The elector, impressed with esteem and gratitude towards him, wished not to allow him to sink under a labour too severe for him, and desired to find the means of procuring him the repose which he required, without altogether depriving himself of his services: he appointed him his envoy extraordinary and minister plenipotentiary at the court of London. But the rules of England not permitting a subject of the king to be accredited as a foreign minister, the count did not exercise that office, and continued to live in England after his return in 1798 as a private individual. The historical society of Massachusets, on electing count Rumford a member, communicated to him, by their president, about the same time, their unanimous desire of seeing him return to his own country, and take up his residence among them. His answer, which is to be found in the American papers of that time, was very much admired. Toward the autumn of 1800, count Rumford went to Scotland. The magistrates of Edinburgh paid him a visit of ceremony; gave a public dinner on his account, and to these marks of distinction added the freedom of the city, conceived in terms the most flattering. They consulted him on the means of improving the existing charitable institutions, and on the measures proper for abolishing mendicity. The work was undertaken without loss of time, and that great enterprize was finished in a few months with | complete success. The royal society of Edinburgh, and the college of physicians, elected him at the same time, respectively, an honorary member; and the university bestowed upon him the degree of doctor of laws. During his stay in that city he employed himself in superintending the execution, in the great establishment of Heriot’s hospital, of improvements which he invented with regard to the employment of fuel in the preparation of food; and the managers, to shew their gratitude, sent him a silver box, with a very flattering inscription, having on one of its sides a representation, in relief of gold, of the principal front of the building to the improvement of which he had so eminently contributed. Memoirs published by his friend Pictet, and given in Baldwin’s Literary Journal.—Gent. Mag. vol. LXXXIV.